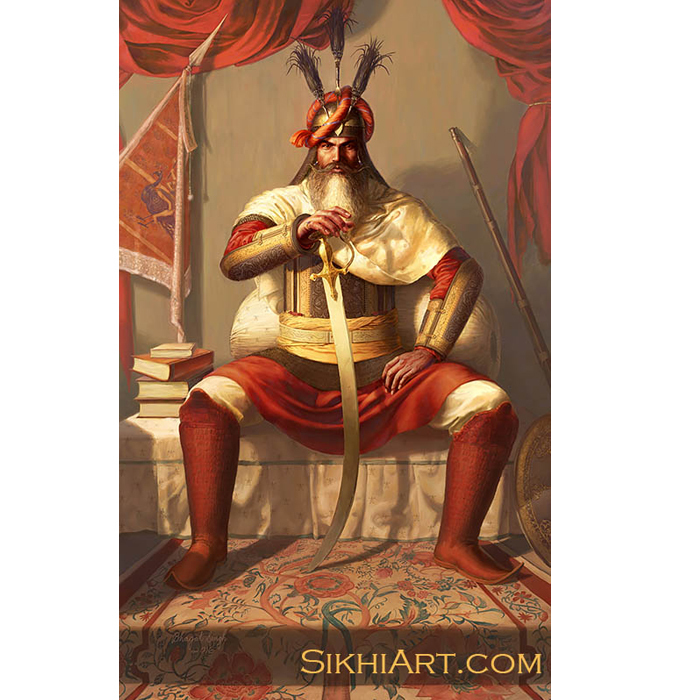 Hari Singh Nalwa was great general of Maharaja Ranjit Singh’s kingdom of Punjab. At a young age, while on a hunting trip, he was attacked by a tiger. With his bare hands, he pushed back the tiger, drew his sword and decapitated the beast. He was known for his excellent swordsmanship and chivalry. 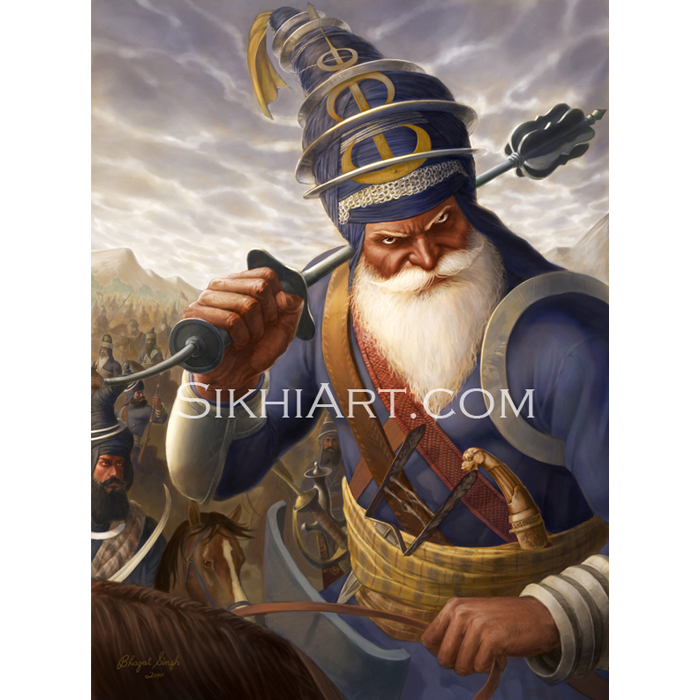 His father had been serving Maharaja Ranjit Singh’s army. All of this became the deciding factors for the Maharaja to accept him in his royal service. He was given a small army of horsemen and so began Nalwa’s career as a General. 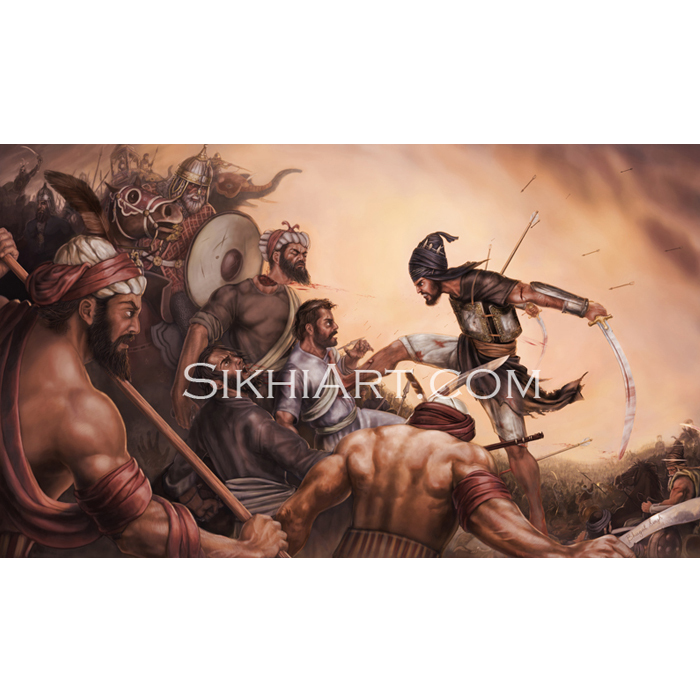 Hari Singh ji participated in the conquests of Sialkot, Kasur (1807), Multan (1818), Kashmir (1819), Pakhli and Damtaur (1821-2), Peshawar (1834) and finally Jamrud in the Khyber Hills (1837). 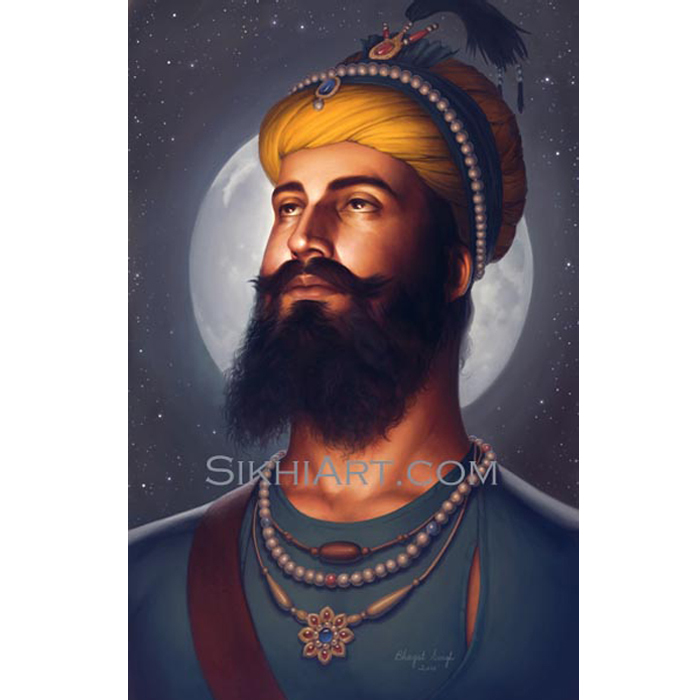 He defeated the Afghans, something the British failed to do, and annexed a segment of what was the Kingdom of Kabul to the Sikh Kingdom in Punjab. In Peshawar, he rebuilt the Bala Hisar Fort in Maharaja’s name. He also built a chain of fortresses on his conquests to strengthen his hold. He also built one in God’s name, Haripur. This expanded the Kingdom of Punjab towards the North-west into the lands of Afghanistan, blocked off the Khyber Pass (which was pass through the mountains often used by Persian and Afghan invaders to loot and plunder Hindustan), and instilled fear of his name among the Afghan tribes. Hari Singh Nalwa was of an excellent moral character. In a conversation amongst Pathans, fierce and unmatched warriors of the north, there was discussion on how a Punjabi Sardar has defeated them on their own turf. Among them was a very young and beautiful Muslim woman named Bano who wanted to meet this sardar. One night she visits Hari Singh Nalwa in his camp telling the guards that she has very important business with their sardar. The guard lets her in. 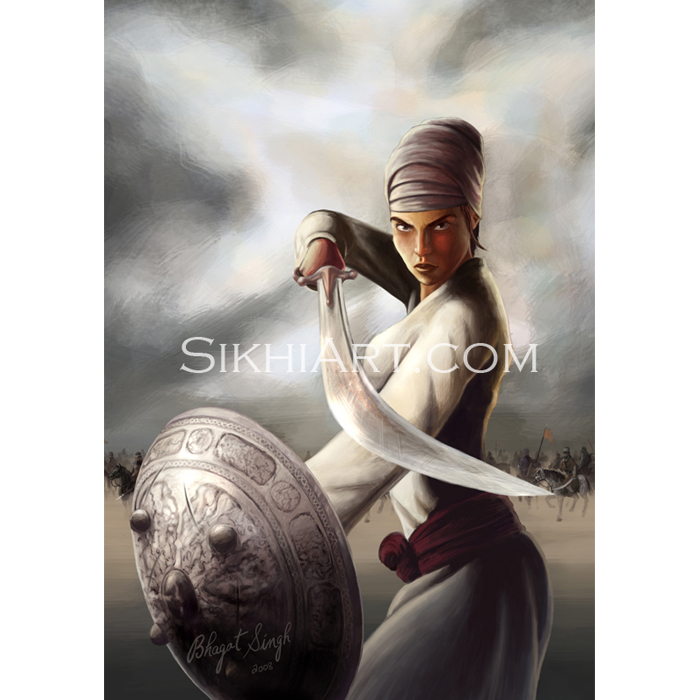 Upon entering she sees Hari Singh Nalwa as the viewer sees him in the painting. She greets him and upon his questioning gaze, asks him why he has captured her homeland. Hari Singh Nalwa explains that they are not here to tyrannize the citizens but to defend Punjab and Hindustan through blocking off the route of all invasions. Upon listening to this she immediately exclaims that if she has a son she wants him to be like Hari Singh Nalwa. 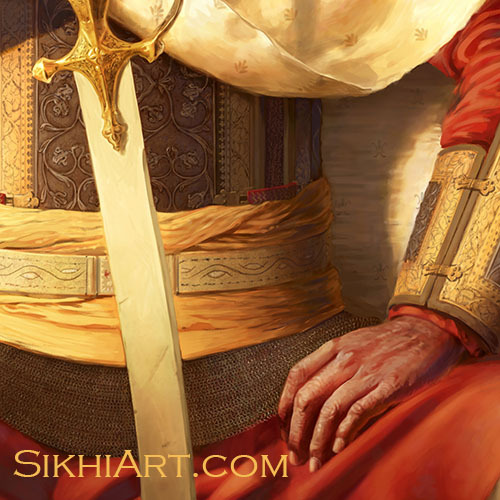 Hari Singh tells her to teach her son to be kind but protective of his family and tribe. He suggests to ask Allah not for a handsome son but for a morally superior one. Bano had something else in mind. She asks him to sleep with her to give her such a son. Upon hearing this, Hari Singh Nalwa gets off his seat, enraged with blood-shot eyes. He asks her to leave. 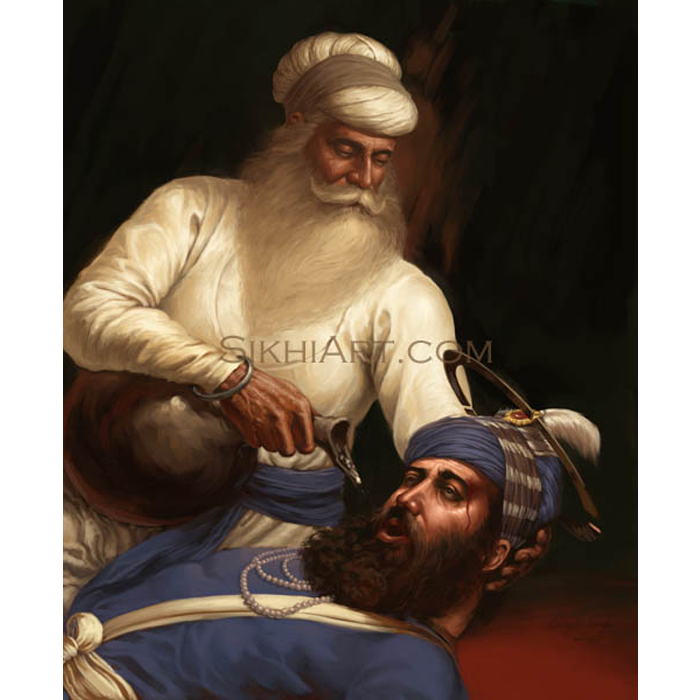 As Bano turns to leave, she mutters, “and here I thought no one ever leaves the house of Nanak (and his followers) empty-handed; I was wrong.” Upon hearing this Hari Singh Nalwa was moved to tears. He calls forth one of his guards to bring him a shawl. Once the guard brings him a shawl, Nalwa asks the guard to place it over Bano’s head. Nalwa steps forth, standing in front of Bano, he says, “Bano you were looking for a son like me?” He touches her feet and says “Bano from now I am your son.” At this point Bano, with now wet eyes accepts the gift and exclaims that she is proud to have such a son. Hari Singh Nalwa died defending the fort of Jamrud at the age of 46. 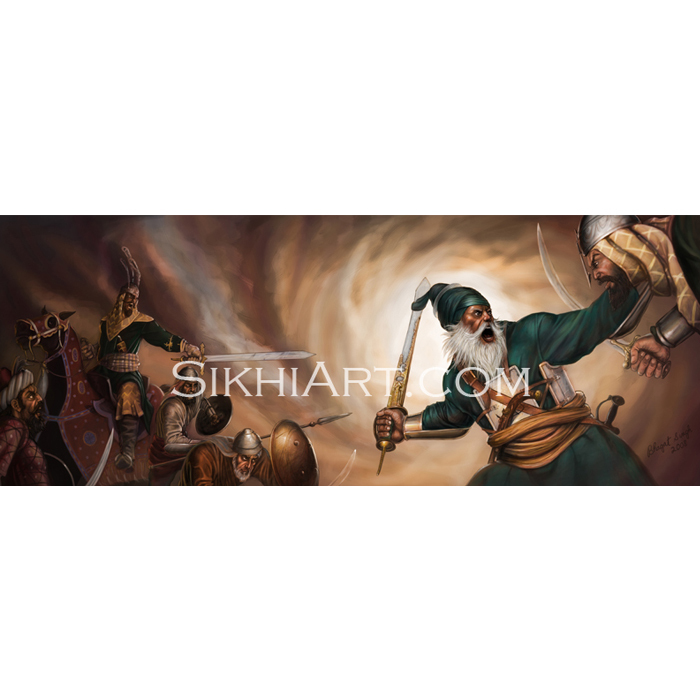 This is my first mixed media painting on Sikh history. It is not completely digital. The carpet was first done on paper in water colour pencils, and was scanned in and added to the painting. It was put into proper perspective with the rest of the painting and was painted over to further detail it and blend it in to the painting. 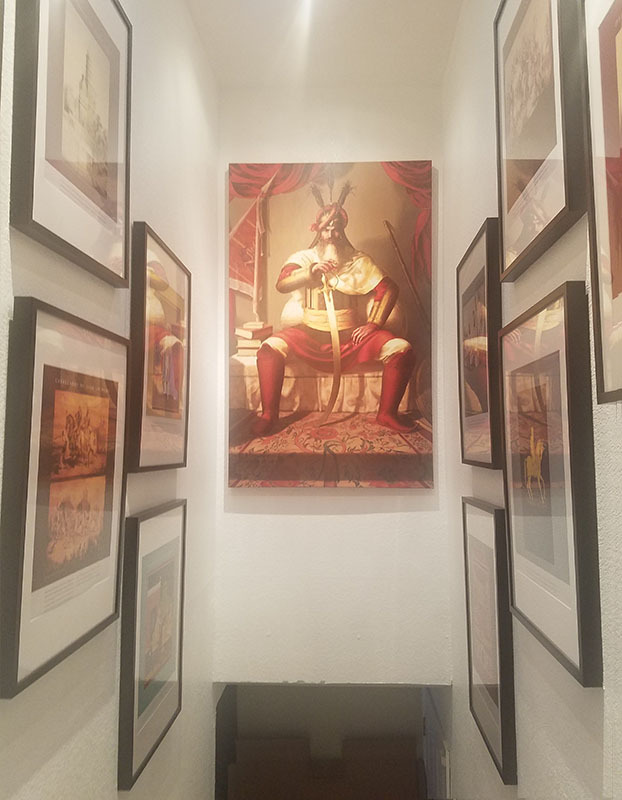 This project spanned three years during which I did as much research as possible to get reference for everything you see in the painting, the battle standard, armour, weapons and carpet. 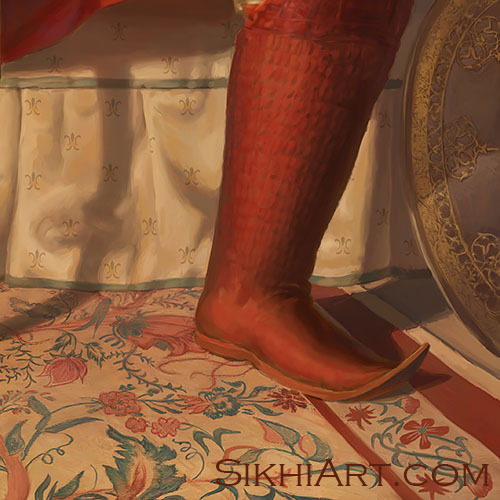 That is my standard way of painting Sikh history. The speed painting which I did back in 2009, before the research, can be found here. My husband Sarvjit Singh Nalwa is the 7th great grandson of Hari Singh. 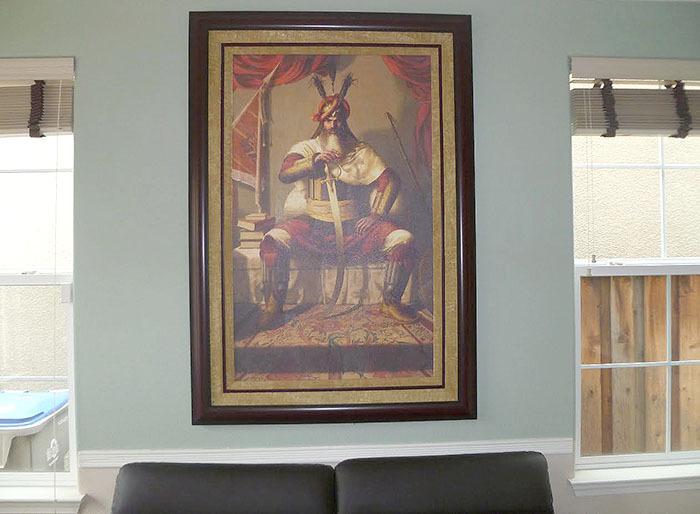 We have this painting in our home. It is beautifully done and a wonderful addition to our home. 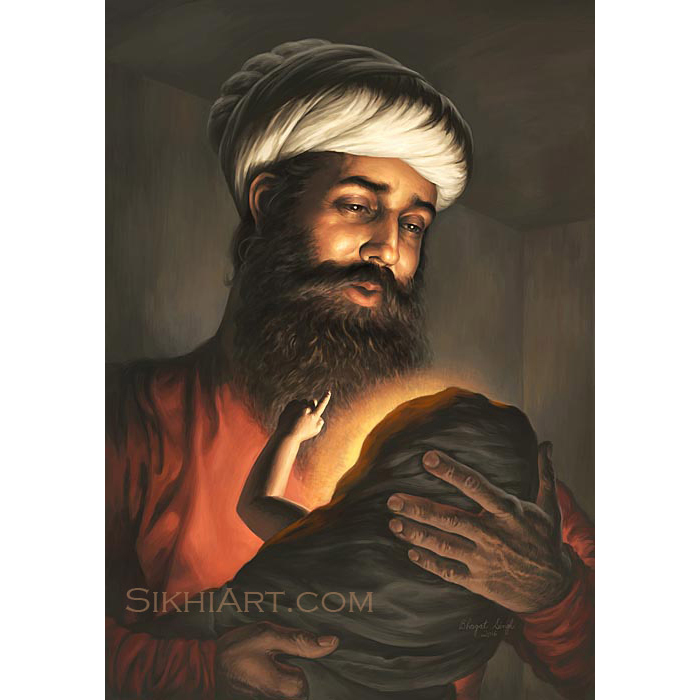 Our daughter is 4yo and tells us of dreams where Hari Singh comes to her and tells her he will always protect her. We love it! 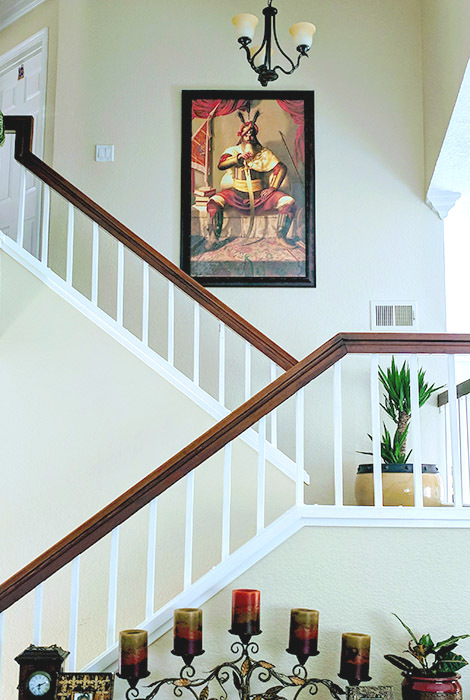 It’s placed so when you enter or home you see it is showcased. People always comment how beautiful the artwork is. The print arrived and has been placed in my hallway. As you can see I’ve been working on other faith prints for the gallery look and feel. This is a work in progress and your piece is the pride and joy. May God bless you for this work and inspiration you are giving to us all. 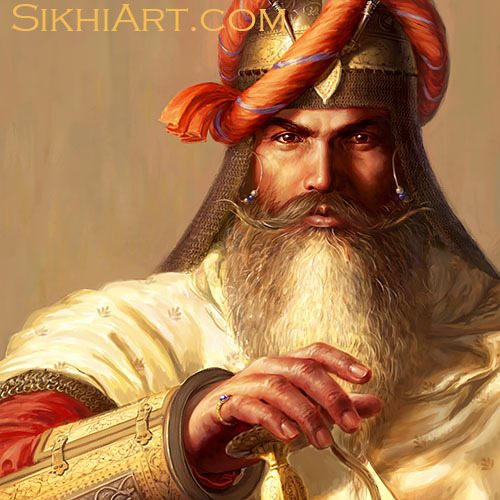 We loved the painting of Hari Singh ji Nalwa. Keep up the good work. The print is Amazing. 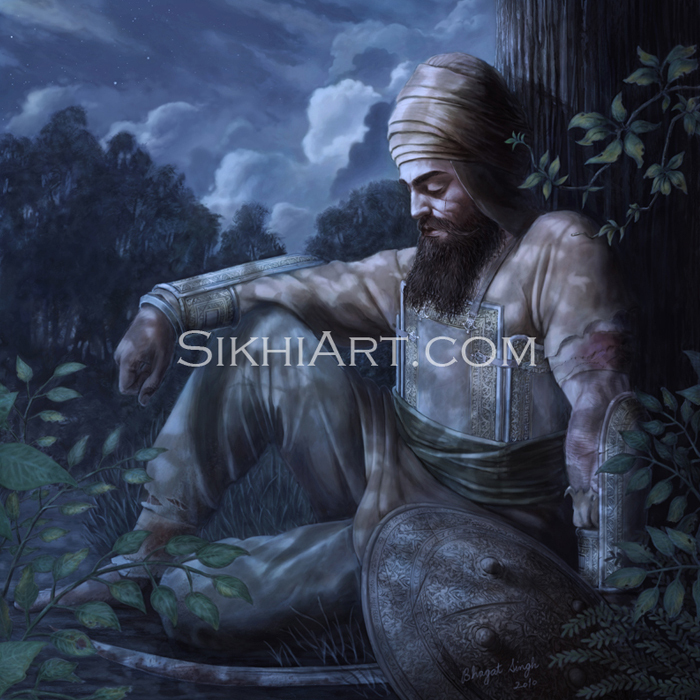 Bhagat has transfered royalty and emotions in this art work which can be felt. 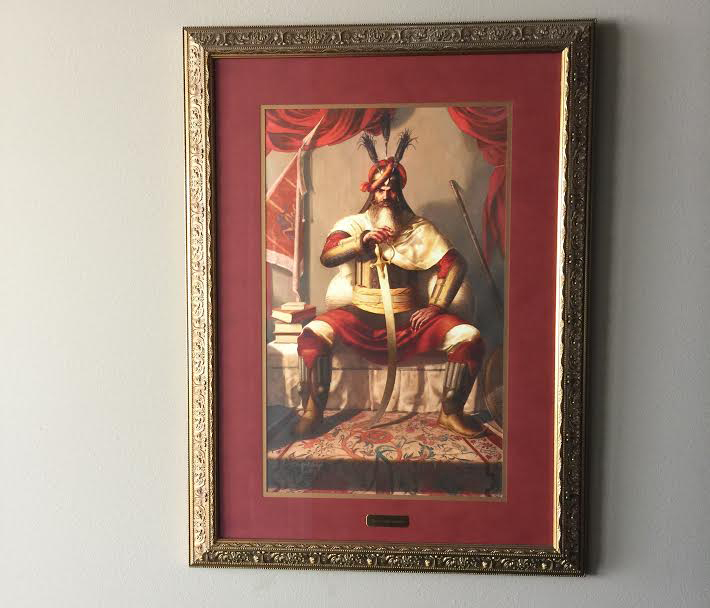 We got the painting! It’s a masterpiece. It’s very beautifully made. My family was very happy to see it. Thank you for making such a master piece. My kids are so empowered by it.